It was a classic Haggard moment: unpredictable, irreverent and hinting at a deeper truth. He didn’t care about the country music taboo against mocking religion; if he had a chance to share a good story—even one as short as a joke—he would tell it and tell it well. And dancing was a key difference between country music in the Deep South, where it got started, and in California, where Haggard and like-minded renegades revamped the genre in the ‘50s and ‘60s. Haggard, who died Wednesday at age 79, was a 21-year-old inmate in California’s San Quentin Prison in 1958 when Johnny Cash performed there (11 years before the famous album). That show made the young con believe that he too could become a singer and songwriter. So when Haggard was paroled, he headed straight for the bars of Bakersfield, California, where young guys like himself were plugging in bright, chirpy Telecasters and driving the beat hard enough to make tired oilfield workers, farmhands and cannery workers fill the dance floors. Soon Haggard was writing lyrics as tough and as aggressive as the underlying music. It’s often said that country music is a combination of Saturday night and Sunday morning. Well, the new music coming out of Bakersfield definitely leaned in the Saturday-night direction. And Haggard’s lyrics transformed that high-octane dance music not with homilies from Sunday morning but with true stories of the first of the month, when all the bills came due without money enough to pay them. In Haggard’s hands, the barreling-train rhythm of the Bakersfield Sound was not just an emotional release from the work week. It was also a blast of anger at a fate that offered only the unappealing options of poor-paying work, prison or the hobo life. Preachers and parents could try to get him to accept that fate like a good boy (“Mama Tried,” he sang), but he was having none of it. He was going to let Saturday night and the first of the month bang up against each other till the sparks flew. “The songwriting came from an off-center situation: the barroom,” he explained. “It wasn’t easy for us, because we had all the mothers against us. Prior to 1950 and Bakersfield’s appearance on the scene, most country music was inspired by church music. Hank Williams sounded like a Southern preacher with a good voice. They wouldn’t even let him sing the word ‘beer’ on the Grand Ole Opry. They wouldn’t let anyone use drums on the Opry. They made Bob Wills put the drums behind a curtain. Well, that was another thing about Haggard: he was prone to exaggeration. He started out on Bakersfield’s tiny Tally label in 1961, enjoying some local hits while learning the ropes in bands led by Buck Owens and Wynn Stewart. 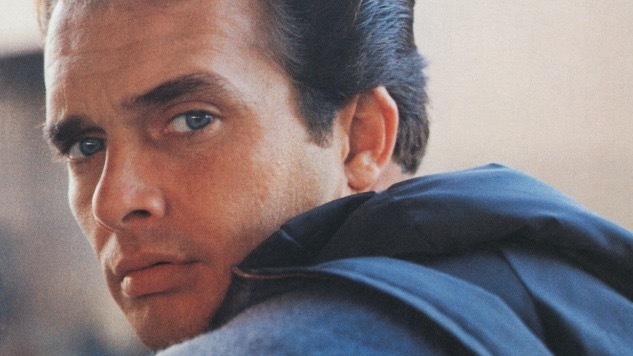 But by 1963 Haggard had his first Top 20 national hit with “Sing a Sad Song,” his first Top 10 hit in 1964 with ”(My Friends Are Gonna Be) Strangers,” and his first No. 1 country hit with “I’m a Lonesome Fugitive” in 1966. It was a quick ascent, and most country fans, even those in the deepest South, eagerly embraced him. How could they not? He had a Steinbeckian backstory. He was a wiry kid with a handsome face, set off by high cheekbones and topped by thick mane of dark, wavy hair, combed straight back. His voice was a sumptuous baritone that hinted at both his inland California childhood and his parents’ Oklahoma childhood. But it was what he did with that voice that was truly wondrous. As written, his songs could be interpreted as the confessions of someone deeply wounded, profoundly angry, stoically philosophical or unstoppably optimistic. But he would make two or three of those possibilities come to life in every song, rewarding repeated listening with a different interpretation each time. His biggest hits were two of his weakest compositions: “Okie from Muskogee” and “The Fighting Side of Me,” compellingly recorded but at odds with the writer’s more complicated self. These conservative anthems of conformism were incongruously written by a hard-drinking, dope-smoking, womanizing, iconoclastic ex-con. He was no closeted liberal, but he was no by-the-book conservative either. His best songs dealt with rural poverty (“Mama’s Eyes”), ex-convicts (“Branded Man”), the handicapped (“Daddy Frank”), layoffs (“If We Make It Through December”), dirt-farming (“Tulare Dust”), untrustworthy politicians (“Rainbow Stew”) and interracial romance (“Irma Jackson”). And, of course, some of the finest songs ever written about romantic relationships and the drinking they inspire. Crucial to the impact of these songs were the Strangers, Haggard’s backing band on stage as well as in the studio. Not for the Hag the Nashville studio musicians who played on so many records that those records began to sound like the same church service. He hired hillbilly virtuosos who understood west-of-the-Mississippi country music, adding an edgy barroom attack to the swinging dance rhythms of Bob Wills, Lefty Frizzell and Buck Owens. Haggard’s last release before his death was Django and Jimmie, a tribute to the French jazz guitarist Django Reinhardt and the Father of Country Music, Jimmie Rodgers, a combination that only makes sense if you can hear the jazzy swing in the country music of Haggard and Willie Nelson, the co-leader on the date. It was Haggard’s fifth collaboration with Nelson—and a sixth has been announced as a summer release.